Since I spend so much time eating cupcakes, I figured I should also learn out to make them, outside of a box mix that is. 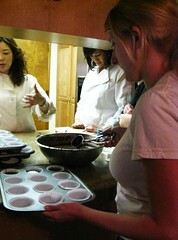 The opportunity presented itself in the form of a private cupcake baking and decorating class offered via L.A. Foodies+! and taught by pastry chef/owner of Gormandise Desserts, Clemence Gossett. 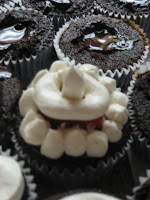 We started the class with a chocolate cupcake recipe and while that was baking we moved on to a vanilla bean recipe. When they were both in the oven, we learned how to make a chocolate ganache and unbelievable meringue buttercream frosting. 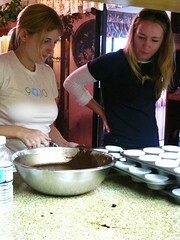 We filled both the chocolate and vanilla cupcakes with the ganache and learned how to apply the buttercream like a pro. In a large bowl, whisk together 3 1/2 cups flour, 3 3/4 cups sugar, 2 tsps baking soda and 1/2 tsp salt. Pour butter mixture onto dry ingredients and mix until smooth with a wooden spoon. Whisk in 4 eggs and 1 egg yolk. Add 1 cup sour cream. Bake at 350 until knife comes out clean. That was definitely a fun class and Clemence was awesome. She's a real good teacher and offered lots of great info plus her cupcakes were definitely tasty! Nice to see you in the kitchen, doing your duty, Tara! Ha! Completely kidding. I think cooking classes, even if you already know how to do basic stuff, are fascinating. Now I just need to get the Culinary Institute of America to give me night classes on all the interesting things in the culinary arts. Yummy! I'm going to try it. YUMMMMMMMM...that sounds like a delicious lesson! Oh man those look delicious. I love cupcakes. I was on meetup.com this evening and saw that your cupcake group has exploded. As stated before, I do not join because I want to lose weight. 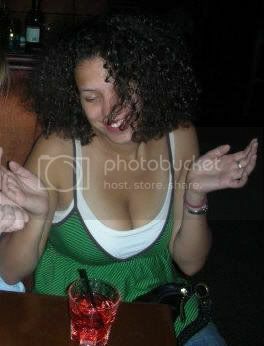 That said, I haven't lost a pound since we last discussed your group, so maybe I should just go ahead and join!